A brief account of the major Uganda’s regimes cannot possibly do justice to their impact to on the country today, but in order to understand, one must begin somewhere. However, this short piece is designed to provide an overview into the deep-seated issue of authoritarianism in Uganda. Uganda gained its independence from the United Kingdom in 1962 and became a federal system made up of the old kingdoms of Ankole, Buganda, Bunyoro and Toro under the presidency of Sir Edward Muteesa II and the Prime Ministry Milton Apollo Obote. Though British rule left much to be desired, the rule of various regional leaders proved to be less than optimal. Obote was the first leader to truly take the reins of the newly unified country, preceded by Muteesa who was the king of Buganda, the largest of the regional kingdoms, after being appointed by the leaving colonizers. Obote did not set a precedent of proper rule and it only got worse. All other leaders of Uganda are often overshadowed by the “Butcher of Africa” Idi Amin, who is considered one of the worst dictators in modern memory. Currently, Yoweri Museveni has put law changes into action to prolong his presidential terms for more than his already thirty-two-year long tenure and has shown increasingly autocratic tendencies that are becoming increasingly violent and suppressive. Uganda’s people must more than ever before understand the debt their leaders owe them and must question those leaders any time they are not living up to the standards they require of them. President Milton Apollo Obote is the first leader with truly authoritarian tendencies. Though he is often overshadowed by the brutality of Idi Amin, between 100 and 500 thousand deaths are attributed to his regime, often those perceived to be political dissidents, comparable to Amin’s 300-600 thousand deaths. Obote came into power by unseating Muteesa from the presidency and forcefully acquiring executive authority through use of the military. This reliance on the military to give his regime credentials legitimacy was Obote’s greatest downfall. Idi Amin, one of Obote’s closest military advisors, carried out a coup with the help of the British and the Israelis and under him Ugandans lived one of the most infamous decades in their history. Although it was a short rule, Idi Amin’s regime was characterized by its brutality and lack of logical politics. Amin himself was a demagogue that appealed to the nationalist sentiments left over from the colonial period as well as taking advantage of his own charisma and ability to instill fear to keep power. As stated, his regime’s death toll is at least 300 thousand. Many of these were political executions of Obote’s men or anyone assumed to be one. Amin had all of the telltale signs of a dictatorship, ruling through violence, execution of political opponents, grand promises and grander personal claims. Amin declared himself ruler for life in the later stages of his rule and fully intended for that to be true. Fortunately, this grandeur and his nationalistic xenophobia became his downfall. Amin singlehandedly crashed the Ugandan economy by calling for the deportation, arrest or execution of all Asian immigrants who upheld a bedrock of the recently freed economy, which bred resentment in many citizens who felt the monetary toll of this policy. His final mistake culminated in his exile as he provoked the armies of Tanzania and Israel by holding Israeli citizens hostage (the infamous Operation Entebbe) and later invading Kagera Salient in Tanzania which led to military defeat and his regime’s end and the return of Milton Obote. Obote returned to power for a period of 5 years and fell into the same pattern of paranoia and violence that characterized his first stint of power. Beginning from a rigged election, Obote used the military once again to suppress dissidents. Obote was soon toppled once again leading to a few liminal leaders taking power briefly. 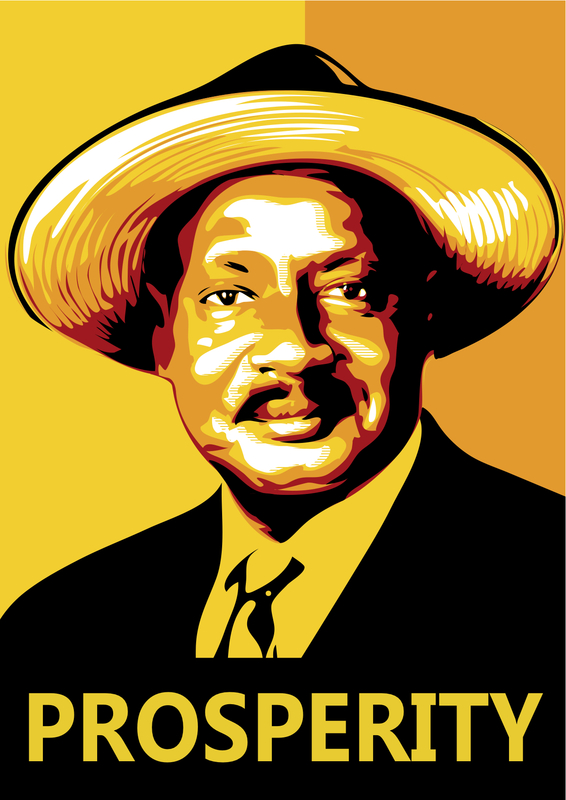 Following these liminal leaders, the next president of note is Yoweri Museveni, who has been in power since 1986. Museveni, like Amin came to power as a hero to the Ugandan people, promises of the people’s rights and democracy littering his rhetoric, despite being a leader of the guerilla force the National Resistance Army that forcefully put him into power completely absent of democracy. These promises of democracy seem to be even more hollow as the decades go on. One of Museveni’s first mandates was to ban political party meetings, only allowing for “meetings intended for unity along the lines set by the government.” Beginning a government in this way disqualify the title of “government” immediately, according to democratic standards. It took 10 years for Museveni to allow for presidential elections at all, and when “democracy” finally came, it was rigged for the incumbent. Even with all of this, there is little hope the state of things will change naturally considering the state of the government being cluttered with confidants and replacements that will likely continue the cycle of suppression in Uganda. Many onlookers are wary of the nepotism that is rampant in his administration, such as his wife as Minster of Education and his brother as a presidential advisor. However, the most concerning of the bunch is certainly his son, Major General Muhoozi Kainerugaba, who has rocketed through the military ranks and has become a leading candidate to replace his father. As he seems to have power secured for years to come, Museveni has had no qualms with using it to benefit himself or those close to him. One of his greatest enemies in elections and in keeping the peace of the people with his nefariousness is social media. As such, he has placed hefty taxes on anyone wishing to use social media. In what Human Rights Watch describes as “just another clumsy attempt to stamp on free speech,” Museveni continues to chip away at the freedoms that are meant to be above the will of a government. Attempting to suppress dissenters through the blocking of social media as well as a history of arresting journalists are telltale evidence of an autocratic regime. Museveni’s greatest enemy in the time to come will be an informed populace that will hold him and whoever replaces him accountable to the will of the people. Where is Uganda heading Under Museveni? Uganda has an unfortunate history that is completely absent of proper democratic governments and completely filled with overt breeches of human rights of the citizens the government is meant to protect. Museveni may not be as overtly violent as his predecessors, but his autocratic tendencies actions must not be ignored! His actions will become violent if left unchecked! Government officials must be held accountable in Uganda and throughout Africa for that matter, the people must have the ability to air their grievances, and presidential term limits must be a nonnegotiable as they are the most direct check on the possibility of dictatorships. President Museveni has secured power for a large part of his life and has likely secured it for years to come through his children. Ugandans must ask themselves, is it okay that these are the only people allowed any true freedom? How much longer will citizens continue living under the thumb of a ruler that is meant to serve them? Only the future knows how long the effects of this harsh time in history will last.